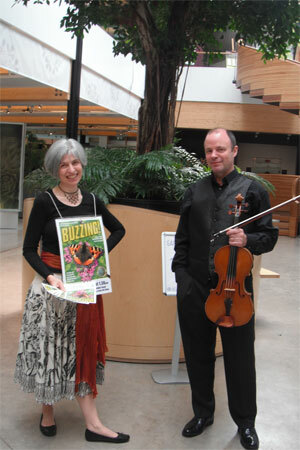 I’m back now from performing my award-winning eco-show Buzzing! 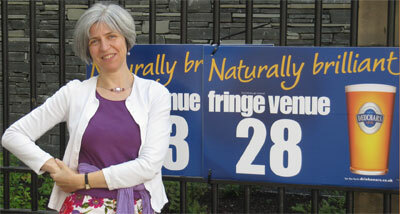 at the Edinburgh Fringe 2010. What an experience – with 6 consecutive shows and a live interview (and poetry performance) on BBC radio! I was performing, with my musician John Rayson, at venue no. 28, the Patrick Geddes Room at the gorgeous Royal Botanic Garden Edinburgh. So, all in all, job well done! Many thanks to the Royal Botanic Garden Edinburgh for hosting us – especially to Amy for her impeccable and extremely friendly organisation, and to Sheena and all her staff, and Giles and Anna. To Yvonne and her family (especially Lewis) for all their marketing work on our behalf. To Nina for her warm welcome. And to my husband Mike for being front of house staff, flyer-giver-outer, chauffeur, roadie and general factotum. And a huge thank you to all our audiences – a very international bunch, from Scotland, England, Singapore, Venezuela, Ireland, Spain, USA … and no doubt other countries I didn’t find out about. Thank you for coming along, and for being so enthusiastic about our show. I wish you all happy bug hunting, wherever you are!